It has been observed that one needs to match perfectly standard-sample concentrations to achieve good sample-standard bracketing precision on Δ56Fe/54Fe (‰) and Δ57Fe/54Fe (‰) when using dry plasma. The goal of our internship is to assess the performance of the NPII Multiple Collector-Inductively Coupled Plasma-Mass Spectrometer (MC-ICP-MS) for Fe isotopes depending of the type of sample introduction and the concentration difference between samples and standards. Figure 1: Photograph of Fe peak on MC-ICP-MS. Analysis was done on the left shoulder. During the two weeks at the Nu Instruments factory (Wrexham, UK), we explored two introduction methods for Fe isotope analysis using two Fe standards: wet and dry plasma. In wet plasma, the sample in solution is directly introduced into the plasma, whereas in dry plasma mode, the sample in solution goes first through a membrane that removes the solvent. 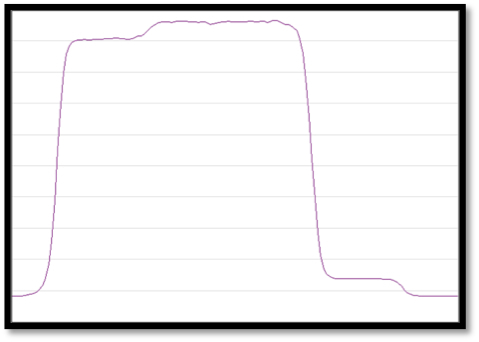 For all the experiments, we were analyzing in Pseudo-High Resolution: we were measuring the Fe isotopic ratios on the interference free peak shoulder (Figure 1). We checked the resolution before each experiment so after the two weeks we got quite good at calculating resolution! The first experiment was to run solution with different Fe concentrations on wet plasma to see when the mass bias occurred (Figure 2). During this first test we also looked at the difference of precision achieved using either blank subtraction (after each wash a blank is measured) or ESA deflection (average blank measurement on the peak at the beginning of analysis). Based on the results, the other experiments were conducted using blank subtraction. During the second experiment, we tested the effect of concentration differences when using an Apex Q (still wet mode but with a bigger spray chamber, Figure 3). Then we looked into their effect when samples goes through an Aridus II (dry plasma, Figure 4) and finally we examined the mass bias using an Aridus II followed by addition of solvent before introduction into the plasma. Figure 2 (LEFT): Photograph of the setup during analysis in wet plasma. Figure 3 (MIDDLE): Photograph of the setup during analysis in wet plasma using an Apex. 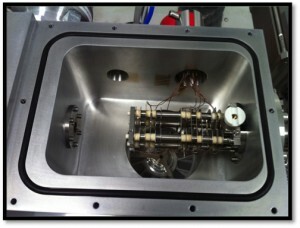 Figure 4 (RIGHT): Photograph of the Aridus II used during analysis in dry plasma. At nUBC, PCIGR (UBC), we will repeat these tests on the NPII 214 and the NP1700. This will tell us if we get the same results on different instruments and with true High-Precision (NP1700). At the end of our internship, we will have a better understanding of the mass bias observed during Fe isotope analysis and the Nu Instruments factory may be able to recommend a method to its customers. Figure 5: The transfer lenses in the transfer lens chamber. The HR slit sits at the far right end of the transfer lenses. Because we were working intensely on the Nu Plasma II using a variety of sample introduction methods, there were several adjustments that needed to be made to the instrument over the course of the 2 weeks. For example, we had the opportunity to change the sampler cone and skimmer cone depending on whether we were running the instrument in wet or dry mode. Measuring Fe requires the high resolution (HR) slit in order to resolve the interference free shoulder of the Fe peak. 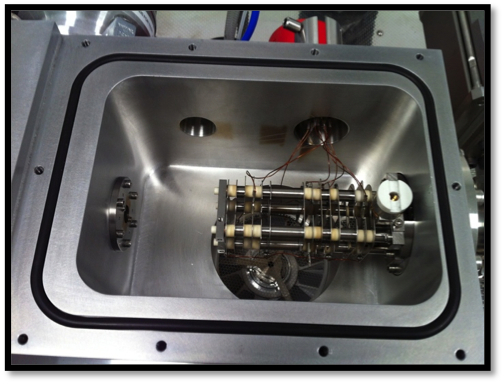 The HR slit removes around 75% of the ion beam and this slit will slowly increase in width with regular use. Therefore, routine maintenance includes changing the HR slit and we were able to watch as the transfer lens assembly was removed, the HR slit changed and the transfer lens chamber pumped down afterward (Figure 5). The measurements we were making lent themselves to these changing instrument configurations and because of this we learned a lot about the internal workings of the instrument! Given our limited time at the factory, it was necessary to run overnight in addition to during the day so we relied quite a bit on autosamplers during the night. Multiple mornings we arrived to find that the autosampler had malfunctioned, which taught us an important lesson; the instruments are much more reliable than the autosamplers. During daytime runs we had the opportunity to talk with applications scientists and engineers working on the other instruments at Nu, including the TIMS, the Astrum, the Noblesse and the Panorama. 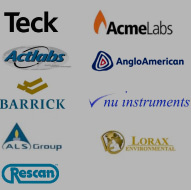 Many different sample types can be measured on the amazing range of instruments available; from a solid state elemental analyzer, the Astrum, to a noble gas analyzer that can measure samples as small as 106 atoms, the Noblesse. The Panorama is a giant instrument that will be capable of measuring isotopologues of gases like methane, which require extremely high resolution and high sensitivity. We saw the new TIMS instrument that is being manufactured and talked with the applications scientist who is working with it. This TIMS instrument has fixed detectors which require the zoom optics patented by Nu. After two weeks of being totally immersed in the Nu factory, we felt as though we had attended mass spectrometry summer camp. We had a fantastic time and learned so much from all the incredible scientists and engineers who work there!